Relax In Our Comfortable Beachfront Setting And Savor The Most Exquisitely Inspired Cuisine South Florida Has To Offer. The Sights Aromas And Tastes Of Oceans Will Awaken Your Senses With An Unparalleled Dining Experience. Oceans 234 Has Proved Time And Again That We Are "So Much More Than Just The View." Flanigan�s is famous for our legendary Baby Back Ribs, and we sell over a million pounds per year. We are also known for our fresh fish selections and unique preparation options, such as Dolphin Francaise and Blackened Tuna. 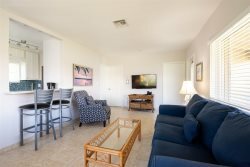 JB�s on the Beach offers� beautiful ocean views, cool tropical breezes, friendly service, warm ambiance and simply great food, since 2002, right on beautiful Deerfield Beach. For over 30 years, The Whale`s Rib restaurant right on Deerfield Beach has been THE hot spot for great seafood and great prices! "This is the food we grew up with, that our parents and grandparents brought from Cuba." Cuban cooking doesn`t blast your taste buds. The flavor comes from marinating and the combination of foods and spices." Little Havana has a full bar and a great Spanish sangria.